I thought I'd post a quick recap of three races I recently participated in. 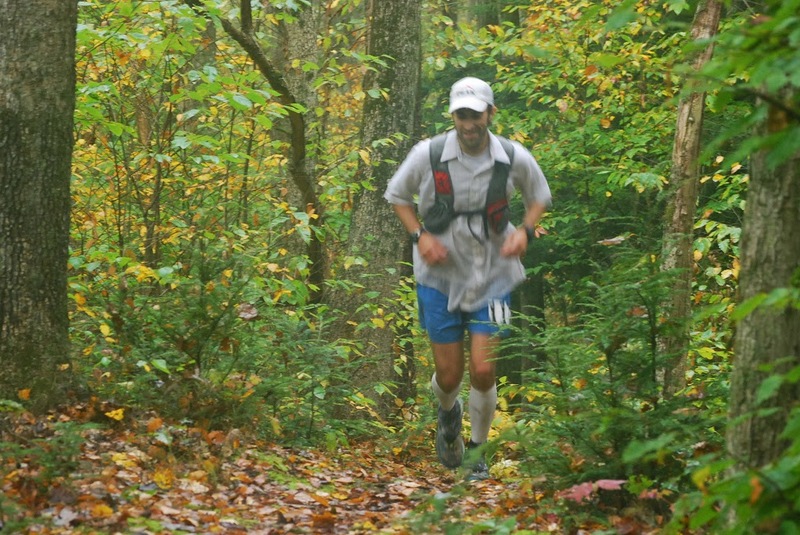 First off, my disclaimer for these races this year would be that since finishing Leadville, I have simply not had the time to maintain a proper "ultra" fitness level. My normal 6 day-a-week running schedule has been hampered immensely by a heavy research load, and I knew going into all three races that my times would simply not be as competitive as usual. Still I enjoy running both new and familiar courses, and getting out for long races gives me solace during otherwise stress-filled schoolwork and writing-filled marathon sessions. All of the recaps will be succinct, simply-worded, and really just touch on the basics. 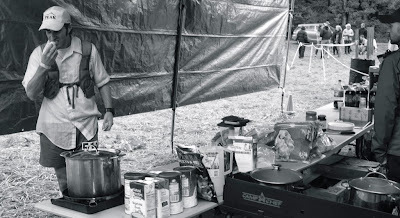 This was was my second year at the Pine Creek Challenge 100k, and I knew it was going to be a different experience. Somehow last year, I managed to finish in a time of 10 hours 21 minutes, locking in my only outright win of any race to date. I knew based on some of the competition this year, and on my aforementioned lack of training, that I would likely not repeat this. Still I was hoping to at least try to keep my time at or under 11 hours. Weather was much better this year and I tried my best to simply keep a moderate pace and enjoy the beautiful run. There is essentially no climbing at all, and the entire run is on a windy bike path of crushed gravel and dirt. It is a great place to get lost in the miles. I had 6 episodes of NPR's "Wait wait...don't tell me" and "Car Talk" to keep me laughing while enjoying the cool late-summer air. Within the first mile I was running a moderate 8:30-9:00 min pace and found myself in third place...and that's where I stayed all day. No one ever passed me, and I never caught up to the top two runners. I had the entire 62 miles to myself and it truly felt like I was out for a very long Saturday run. Like last year, I enjoyed the wonderful geology along the creek, saw a few eagles, and took time to chat with the aid station volunteers. By mile 45 I was considerably more tired and worn down than last year and I definitely noticed my miles were ticking by slower. I was also walking a bit more than last year as well. I chalked this all up to my lower fitness level. As I neared the finish though, I was pleased that I was still able to pick up the final pace just enough to squeeze in under 11 hours and clock a time only thirty minutes slower than last year. I finished third and never felt that I pushed myself too hard. I was certainly more tired during the run and not in as good as shape as last year, but I had just as much fun (if not more!). So good stuff all around. Sadly, my standing course record was broken by Travis by 27 minutes. Hitting the bike-path at the start of a lovely 100k run. won, and Mark took 2nd. 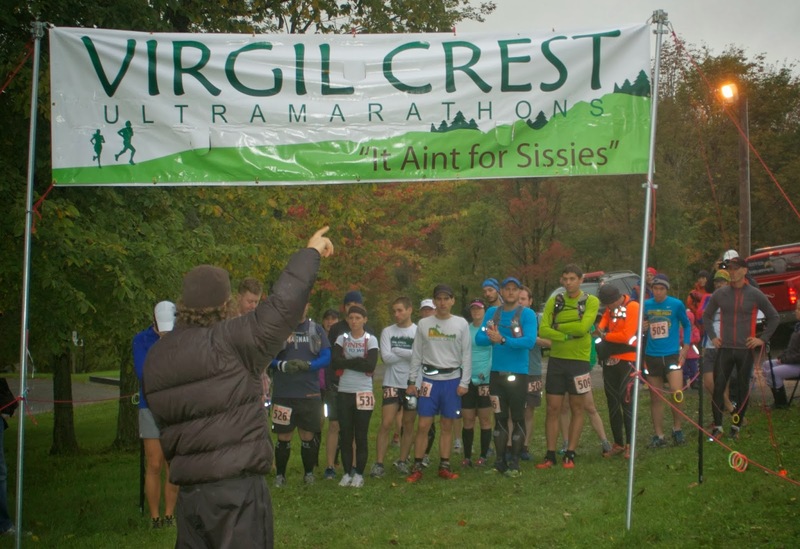 Signing up to run the Virgil Crest 50k was literally a last minute decision. I knew I would be up in New York getting ready to fly out to San Diego for a science meeting, and I thought throwing in a "quick" 50k after spending a full week processing data would do me some good. So I signed up on the last day I could just minutes before the registration page shut down. What I didn't realize, was just how friggin' tough of a course Virgil Crest throws at you. Holy cow batman, it is a very demanding race. Add to that the fact that the area got 24hrs of rain before the start of the 50k and needless to say, the entire race was a slip-and-slide of muddy mayhem. It was brutally difficult, had me wiping out all over the place, and I was definitely not prepared for the almost 7000 feet of elevation gain either. 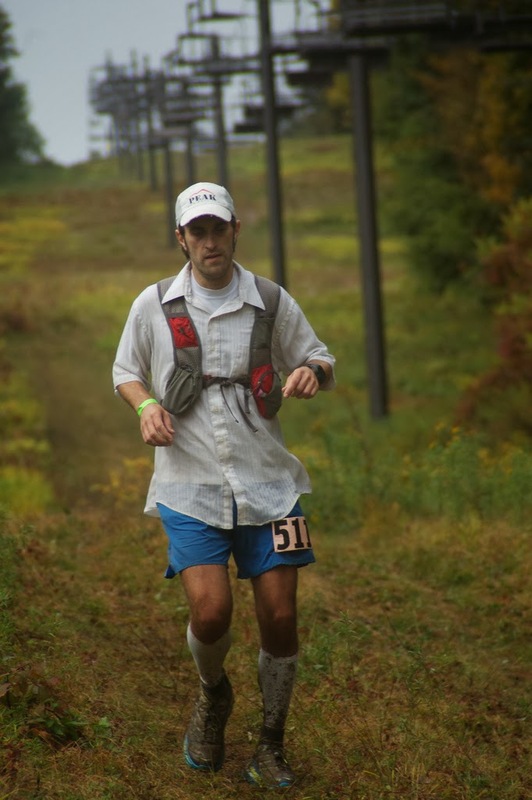 The 100-miler had a ridiculous attrition rate this year with more than 70% of the runners either DNFing or dropping down to the 50-miler mid-race. It was brutal. BUT...the course was pretty stunning. In better shape and more prepared, I think I would have really had fun attacking it. Still, I did my best to enjoy the day despite the ridiculous conditions. I ended up becoming completely exhausted by mile 25 and basically walked/slopped several of the final miles. In the end, I crossed the finish line 8th overall (5th men), in a time of 6:24. Truthfully, I was surprised I did even that well. The course features several ridiculous Barkley style climbs and is definitely a worthy challenge. There a decent chance I will be back to play on this course again in future years. Props to the director for putting together such a killer course and race right in my relative back yard. 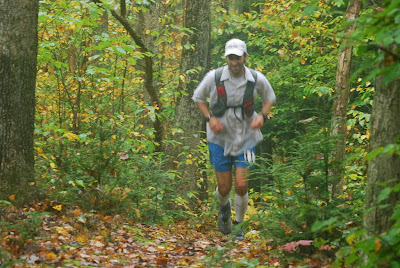 This past weekend I took part in my third consecutive Oil Creek 100. This race has always been good to me, giving me thus far two sub-22 hour finishes and my current 100-mile PR. This year I had little doubt that my time would be slower, and with a rumored high-humidity day, I pretty much surrendered any idea of a sub-22 this year from the very start. My goal was simply to stay motivated and not succumb to any desire to drop early. The morning temps were pleasant at the start (unlike last year's 28F), and I made sure to take the first 31-mile loop somewhat easy. I found a nice pocket of runners to hang with and the temps were still decent enough to feel strong through those early miles. I hit the familiar milestones along the beautiful single track and truly thought I was going to thoroughly enjoy my three loops this year. But after starting out on my 2nd loop after a respectable 6-hour first loop, I found my drive and motivation had plummeted. The humidity was downright asphyxiating and I just had no desire to be out there. I could not imagine myself in any way going out for a third loop, despite the fact that I always enjoy night loops the most. Getting through that 2nd loop was painfully difficult. I struggled in every way. Nausea, apathy, heel pain, soupy humidity, overall incredible exhaustion, and even chafing. Nothing was going right and all I could think of was getting back to the start and calling it at 62 miles. I was so damned tired...and no matter what food I forced down my throat, I simply could not get the furnace burning. I was a sluggish mess in every way. Even when I did get back to the bike path on my final few miles of the 2nd loop, I found I couldn't even really run them...something I have always done in the past. When I made it in, I sat for a very long time at my supplies bin. I put on a clean/dry shirt, ate a lot of different foods, and rested myself considerably. After a good 30 minutes I finally decided that quitting wasn't in the cards and I grabbed my headlamp to head out on a fun night loop. I had come to terms with the fact that it was going to a tough race to get through, and at least the sweltering day was over and I'd get some fun night running. The third loop was definitely slow, but I found myself at peace with it and was able to have some level of eased contentment about it. I didn't run very much, but managed quite a bit of slow shuffling. I stopped and rewarded myself with a 5 minute sit-down break at every aid station and decided there was no point in rushing. A sub 22 was well gone now, and I had no reason to push. Eventually, little milestones would pass and after a very long 7+ hours in the dark, I found myself back on the bike path coming into the school at 91 miles. All that remained was the 8+ mile mini-loop to finish. Historically I have done this loop in about 1 hour 45 minutes and quite frankly at this point I just wanted it to be over. I looked at my overall time and when I came into the turn around and it read 22 hours exactly. I was quite surprised that I was still doing as well as I was and realized I could still shoot for a respectable sub-24. 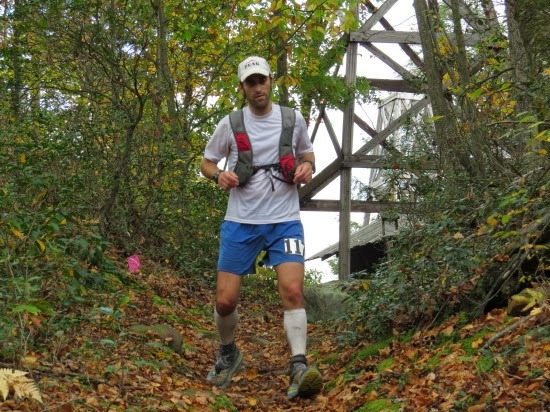 There something mentally to be said about finishing a 100-miler in under a day, and knowing my previous times for the 8 mile mini-loop, I knew it was possible. The only problem was that I was still so damn exhausted. I figured I'd do my best, but if I came in over 24, so be it. I shuffled out of the station slowly and hobbled my way down to the trailhead. I made my way to the mile 3 turnoff and walked my way along the creek to the suspension bridge. At the dreaded hill of truth, I did not attack it anywhere near the level I did last year and frankly struggled up it. 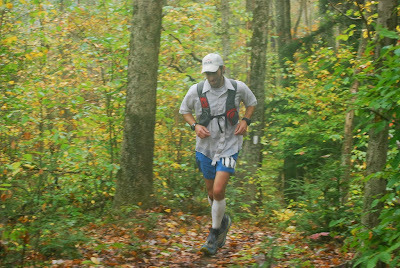 I was in rough shape, but at the top, I knew I had an easy 3 miles to the finish. I got a little pep back in my step when I knew the end was within reach and I managed to jog the remaining 2 miles along the bike path and road back to the school. I crossed the finish in 23:46 and was ecstatic to simply be done. I crashed in my tent for a few hours and then drove home early in the morning nursing a sore foot. Similar to my experience at Massanutten last year, my biggest struggle at Oil Creek this year was just maintaining a positive attitude about being out there. 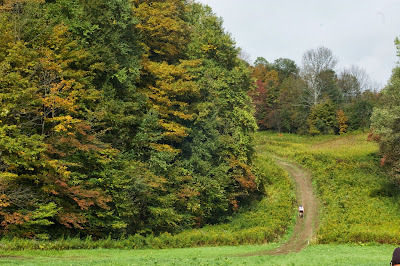 It should be a no brainer when you get to play on beautiful trails in the woods for an entire day, but when the body is not doing so great, your mind systematically tries to follow suit. It takes a lot of effort to fight off that DNF urge. I barely did. 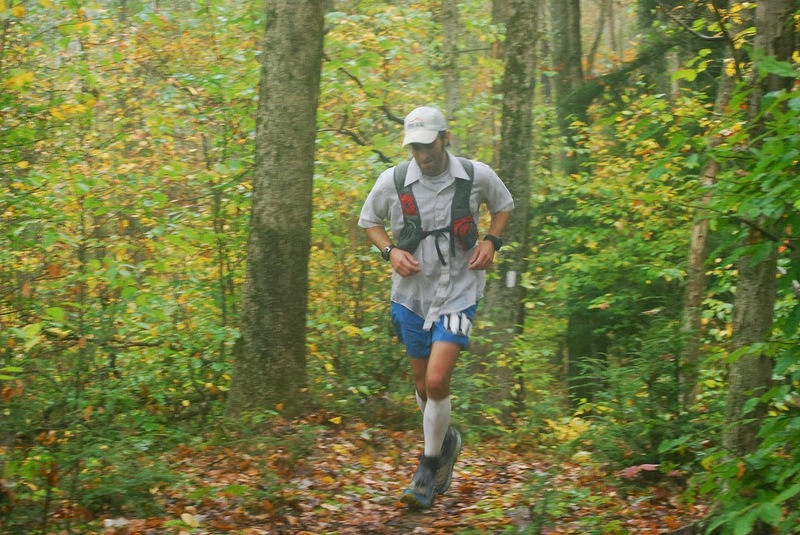 I came frighteningly close to a willful DNF this past weekend after 62 miles....but just by giving my body some time to feel better, my mind did so too. Sometimes that's all you need I guess. A side note about my Garmin. It managed to last 23 hours 40 minutes before it finally died. For a device that supposed to only last 20 hours, I was quite impressed with this considering I had it recording data every second, with lap alerts, AND a heart-rate monitor. It literally powered off about a half-mile from the finish line (see track above). Mile ~44ish on loop 2. Sooo not into it. Quite miserable actually. Looking ahead, I've got two more ultra events on my schedule (Tussey 50, and NJ One-Day) before essentially shutting down for the season. Both of these are currently "maybes" however, as I somehow managed to ding up my foot pretty good at Oil Creek. It appears I rolled an ankle and caused some not-so-lovely swelling. Not sure I'll be in running shape in the coming weeks. Guess we'll see how far the icing and advil get me. At first I actually thought it may have been a stress fracture, but the swelling came down a lot and I am able to walk on it now. It appears to be healing fast and is very reminiscent of the injury I incurred at my very first Vermont 100 back in '09 (which was soft-tissue related and healed in a about a week).